The Fountainhead Antique Auto Museum is located in Fairbanks, Alaska at the Wedgewood Resort, a Fountainhead Hotel. 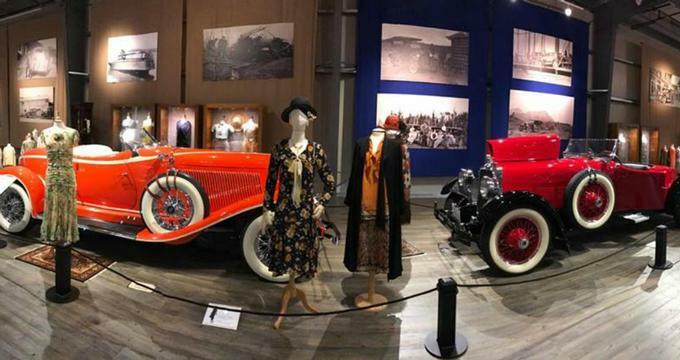 The 30,000 square foot museum displays historic automobiles and clothing, showcasing the evolution of both fashion and cars from the Victorian Age of the mid 1800’s through the Art Deco era of the 1920’s and 1930’s. The permanent collection of over 80 vehicles represents the full spectrum of historic modes of transportation, such as horseless carriages, electric cars, steamers, speedsters and midget racers. Permanent Collection: Highlights of the collection include Alaska’s first car, which was built in 1905 by a man who had never before seen an automobile. An 1898 Hay Motor Vehicle is the oldest in the collection, and the only one of its kind ever built. Other standouts include a 1906 Compound Model 7 ½ Light Touring, and a 1920 Argonne Model D 2-passenger Roadster. The 1921 Heine-Velox Victoria is also a rare find, the only one of its kind to be built. The newest car in the collection is a 1938 Southwest Chrome Special Elto Midget Racer. Many of the vehicles are still operational, and are driven each summer through the resort. An extensive bicycle collection includes a Sawyer Boneshaker Bicycle dating back to 1865, as well as several other models from the late 1800’s. Additional vehicles in the collection include a Cleveland Lightweight motorcycle from 1917 and an Edwards Pioneer Road Grader from 1928. Several engines and motors from the early 1900’s are on display, including a Fairbanks-Morse engine, which once powered Alaska’s telegraph system. The fashion collection at the museum includes over 100 period ensembles, as well as special exhibits related to the history of clothing. The 100 outfits include over 600 items of clothing from the 1700’s through the mid 1900’s. Both men’s and women’s luxury fashion is represented as well as antique shoes, hats and jewelry. Garments on exhibit are rotated every 4 months. Supplementary museum exhibits include period artifacts, an antique gasoline pump, a Ford Model A sawmill, a sparkplug collection, paintings and drawings, and archival videos. A display on the historic Valdez-Fairbanks Trail educates guests on the roadway which first allowed access to Fairbanks and the Alaskan interior year-round. Guests may dress up in period costumes and take photographs aboard an antique car in front of a replica of the Sourdough Roadhouse, a traveler’s haven along the Valdez-Fairbanks Trail since 1903. History: The history of the automobile in Alaska began in 1905 when a young man named Bobby Sheldon built a car to impress a woman he’d met. Although he’d never seen a car before, he was able to assemble a boat motor, two bar stools and a chassis. The early vehicle was capable of traveling 15 miles per hour. Three years later, in 1908, production automobiles reached Alaska by steam ship. Extreme cold, poor road conditions, the lack of experienced drivers, and the lack of repair shops required Alaskans to be resourceful with repairs and modifications. The collection at the museum was begun in 2007 by local Fairbanks resident and entrepreneur Tim Cerny, president of Fountainhead Development Inc. Cerny carefully selected each of the cars for either its rarity, historical significance or technological innovation. Recognizing that cars and fashion have evolved hand in hand as luxury items, the museum displays the two together to offer a wider perspective on the style of the times. The museum is an attraction of the Wedgewood Resort, and receives its funding from the Fountainhead Hotels. The Fountainhead Hotel group operates four hotels in the Fairbanks, Alaska region. Ongoing Programs and Education: The museum offers self-guided audio-tours, or a docent guided tour. Schools and other groups can participate in the audio tours, or book a docent as a guide. Docent-led group tours focus on the history of the automotive industry in America, and the particular struggles pioneering Alaskans faced with automotive transportation. All tours last approximately 45 minutes, but guests may wish to stay for an additional 45 minutes to complete a group activity such as the scavenger hunt provided by the museum. A book about the museum by Nancy DeWitt is titled “Extreme Motoring: Alaska's First Automobiles and Their Dauntless Drivers” and explores the history of the automobile in Alaska, the Last Frontier. What’s Nearby: Guests of Fountainhead’s Wedgewood Resort and Bear Lodge receive VIP access to the museum, and may even see the historic vehicles being driven around the hotel grounds during the summer months. The resort also offers nature trails and a wildlife sanctuary.